That the Ba’alei HaKabalah find mystical connections and meanings in things large and small is a credit to their insight and spirituality. Still, when they draw a direct connection between Purim and Yom Kippurim it feels astonishing to us. To take a holiday in which we dress up and wear masks, in which we drink copious amounts of wine and play games and suggest it is connected to our most solemn, holiest day? Yes, there is the grammatical implication of “Ki-purim”, which can mean “like Purim”, but that is surely a superficial connection. It is true that on both days, we stand before God asking for His grace and compassion to relieve us of our sin and suffering. But certainly, we can agree that there is a significant difference between our inner struggle and need of redemption that animates our prayers of atonement on Yom Kippur and the external forces of Haman, from which we seek God’s redemption on Purim! Perhaps so, but the source of our need for redemption seems beside the point. Rav Soloveitchik points out an even deeper connection between the two days, identifying chance as a defining element on both days. Both involve, “…the casting of lots (goral). On Purim, the goral determined the date chosen by Haman for the destruction of the Jews. On Yom Kippur, two male goats, identical in appearance, size, and value, were brought, one marked “unto the Lord,” and the other hurled to its destruction. How was it decided which shall live and which shall die? Purim is a story filled with outlandish events and almost cartoonish characters. One day, Jews were safe in Persia. The next, destruction loomed. One day, Mordecai faces execution. The next, he is Prime Minister. The randomness of it is astonishing! Rashi tells us that the Kohen, “…placed one goat at his right and the other at his left. He then put both his hands into an urn and took one lot in his right hand and the other in his left. These he placed on them. The goat upon which fell the lot bearing the inscription L’Hashem was for the Lord, and that bearing L’Azazel was later sent forth to Azazel” (Rashi, Vayikra 16:8). So, it is that on both Purim and Yom Kippur, our fundamental vulnerability and the fickleness of our existence are betrayed. 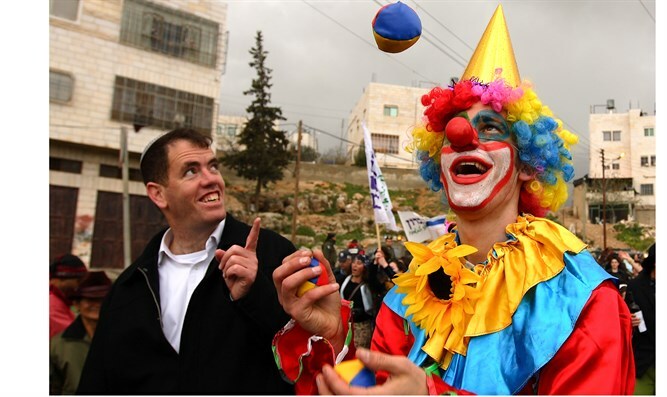 Purim, in this regard, mirrors our world – full of instability and uncertainty. The world is, indeed, a narrow bridge. There is uncertainty within each of us as well. This is what Yom Kippur makes plain to us. What is it that turns one man to sin and another to righteousness? Why do two brothers, twins perhaps, turn out so differently, one a tzadik, the other a rasha? This is the pur of Yom Kippur. It is possible to think of every day as Purim – filled with tumult, confusion, uncertainty, lurking dangers and temptations. So too, we can think of every night as Yom Kippur – filled with regret and sorrow; a need for understanding, compassion, and forgiveness. The Gaon of Vilna taught that there are two exceptions to the well-known principle that every Yom Tov is devoted half to God and half to our pleasures and enjoyment, chatzi l’Shem v’chatzi lachem. The exceptions are Yom Kippur, devoted exclusively to matters of God and spirit, and Purim, devoted primarily to physical pleasures, such as mishloach manot and matanot l'eyyonim. On all other holidays we observe mitzvot, we pray, read the Torah and study. We also eat festive meals, make Kiddush, dress beautifully, and share worldly pleasures. Not Yom Kippur and Purim. Yom Kippur is all spirit and Purim is all pleasure. The Gaon says, Purim k’Purim, both days are two halves of one day, and on this very unique day composed of half Purim and half Kippurim, indeed we do have chatzi la’Shem Vchatzi lachem. So too man. Two forces contained within a single being. Many times, we have explored the dual nature of man; how we each balance within us good and evil, baseness and holiness, heaven and earth. Just as the Gaon sees Purim and Yom Kippur as two halves, or parts, of the same Yom Tov, we are never all of one part of our natures or all the other. We are in constant flux between our “Achashverosh-selves” and our “Mordechai-selves”. Each of us lives with this inner dynamic, this conflict between the Achashverosh within us and the inner Mordechai we possess. Do we listen to the voices of Haman? Do we pay heed to the voices of self-criticism and self-doubt, the voices that lead us to places and situations where we don’t belong? Ah, the siren song of such voices is a strong lure. How easy it is to imagine ourselves sitting at Achashverosh’s banquet table, surrounding by glitz, wonderful – and plentiful – food, interesting (and made more so by the free-flowing wine) people, and joyous music! To sit at such a table is to be a special guest at the most marvelous wedding reception! To sit at such a table is to feel free to be loud and festive. Who would not want to be there? Or do we resist that seductive lure and listen to the voice of Mordechai, whispering to us, urging us, pleading with us to maintain our self-dignity and self-respect? Do we, can we, pay attention to that voice and cling to our Jewishness at all cost, never losing trust in God, never to “bow down” to the crass, to the boorish, to the mere trappings of wealth. Charlie Harary has spoken about the reality so many Jews’ experience. As he makes clear, living in a “Yom Kippur world” poses no challenge for the Jew. For in that world, all is spiritual, focused, and sacred. In such a world, there would be no need to wear a mask to get by. In such a world, we could be honest and joyful, always fully Jewish. But we do not live in such a world. We live in a “Purim world” where the delights of the flesh, the noise, the distractions and lure of Achashverosh’s table is a constant tug. We live in the Purim world and, so we are called on to wear a mask, so we can “go along to get along”. We live in a world of commerce and in the world of commerce spirituality, and Jewishness is often in conflict. On Purim, we wear masks to reflect a miracle “disguised” as a natural event. On Pesach, Sukkot, and Chanukah we recall miracles defined by their “unnaturalness”. Not so on Purim. On Purim, a miracle occurred that was disguised as a curious and coincidental political event. On Purim all are commanded to give to those whose hand is outstretched. To minimize the shame of the poor, we wear a mask – so the pauper doesn’t need to “face me”. Indeed, the Purim story ends with Mordechai and Esther both dressed in royal clothing. Imagine, a story which began with Esther being the only candidate to not “beautify” herself with makeup and perfumes, and Mordechai wrapped in sackcloth praying for his people now in such impressive costumes! Who but God could author such a “masquerade”? In our everyday Purim, we wear masks at work. We are “like” everyone else. And we can maintain a balance. We are competent at our jobs. We excel. But there are times when the conflict between being a Jew and being one sitting at Achashverosh’s table, times when the feasts, the parties, the language, the sights and smells of the carnal world are almost overwhelming. It is a conflict that the newly-graduated yeshiva-bochur certainly feels. Every day, every moment he finds himself in an alien culture, far from the world of study and holiness that surrounded him at yeshiva. But it is also true of every Jew who makes his or her way in the world. On November 30, 2018, Sarit Steinfeld posted on her blog The Working Yid the challenge of “Frantic Fridays” – the glorious challenge of escaping work in time to get everything (including herself) in place for the Sabbath. What a challenge it can be to transverse that boundary between secular person and sacred Jew! She describes the last frantic work emails; the final messages and notes that she must complete to maintain her professional role and then the mad dash home, grateful for a train at the subway station and no unforeseen delays, a quick shower and… the blessed Sabbath. There is not an observant Jew who cannot relate to Ms. Steinfeld’s wonderfully written mad dash home, a hectic journey that would never be necessary in a “Yom Kippur world” but is a constant in the world of Mordechai, where we live.